Moreover, you’ll get a cool present – my new mini-course “Chess training plan for rapid improvement”FREE in return. Just have a look at today’s GM games – full of tactical twists and turns, an intense fight for the initiative, sacrifices for dynamic compensation and mind-boggling complications in ALL phases of the game. Nowadays, you simply cannot win a game of chess with an abstract plan. After all, chess is all about THINKING – which is, technically, called CALCULATING! If you don’t have an EFFICIENT calculation technique, you will continuously get outclassed by players who are strong in those departments of the game. You will LOSE to a tactical oversight after playing 40 good moves game after game after game. Therefore, you will not realize your FULL chess potential. You only have two choices: adapt to this trend or be left frustrated as your chess results rot away and your progress stalls. Just as you need to have mathematical calculations at your fingertips in order to solve problems quickly and easily, similarly while playing a game of chess, you should be able to act like a “chess calculator”. That’s why we’ve invited our guest coach, IM Attila Turzo, to help you in this topic. Hence, IM Turzo will be conducting a webinar on Sunday 5 July at 10 a.m. New York time (check timings here: LINK). P.S. 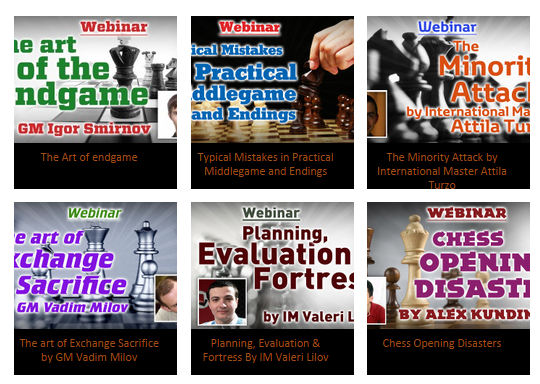 In future, one of our guest coaches, IM Valeri Lilov, will probably be conducting a webinar for you. The webinar TOPIC is not yet finalized. Hence, you are welcome to suggest some interesting topics! J You can comment on them below. Note: we’ll select the majority choice. A few days ago, we added a two guest author’s courses to our RCA Shop. They are “Play like Tal” and “Killer Dragon”by GM Simon Williams. Today, I’d like to remind you of the 30% discount I’ve provided you with during the first few days of the product release. I’ve also studied these two new courses and today I’d like to share MY REVIEW of them. GM Williams has a very entertaining style. It’s enjoyable to study his lessons. He explains lots of typical plans and ideas – in different openings and various middlegame pawn structures. The interactive training method is very useful. While watching the lessons, at critical moments you are given a chance to find the best move yourself. After that, you can see GM Williams explaining different options – both correct and incorrect ones. Hence, you can test and improve your own thinking process. I liked it a lot. On the negative side, I’d say GM Williams’s explanations are not deep enough, compared to GM Sokolov or my courses (forgive me Simon :)). Still, you certainly can learn a lot of good ideas, while having a pleasant time by watching his friendly commentaries. Firstly, Tal is one of my favorite players. He’s the greatest master of attack, which is the most important skill you need in order to WIN chess games. The games presented in “Play like Tal” are both fascinating and useful. I would not recommend this course to the expert-level player. But if you are below 2200 FIDE – the course will suite you perfectly. CONCLUSION: I would definitely recommend that you study “Play like Tal” course. Attack is the most important skill you need, while Tal is the great player to learn it from. It teaches you to play the Dragon variation of the Sicilian defense as Black. This is a very famous opening variation and the Classical Dragon happens after the moves: 1.e4-c5 2.Nf3-d6 3.d4-cd 4.Nd4-Nf6 5.Nc3-g6. In short, Dragon is a complicated but powerful opening. You need to invest quite some time learning it. It’s not that easy, and you should be aware of that. At the same time, the course “Killer Dragon” will make it much faster and easier for you. After that, you’ll get a menacing weapon against White’s 1.e4 move. It provides you with plenty ofattacking opportunities. You can crush even a very experienced opponent. So, that’s definitely great for you! The course contains very detailed analysis and explanations of the Dragon variation. That’s why it suites any player who wants to master this opening. I’d say it’s most recommended for players from beginner till IM level. CONCLUSION: Dragon is one of the good options to play against 1.e4 move, especially if you are an attacking player. If you’d like to learn it, “Killer Dragon” will make it much easier for you. In my previous article (LINK), I told you that new premium videos would be added to our RCA shop very soon. Therefore, today I have some amazing information for you. The author of both of these products is GM Simon Williams. I’ve already published the “Introduction” video of “Play like Tal” in my previous article (if you missed it, check it now here: LINK). I hope you liked that lesson. If you enjoyed the lesson, don’t forget to write your comments below the video and share it with your ‘chess mates’. But wait, I have some ‘gifts’ for you. As I promised, I’m going to provide you these two courses with some special offers, to celebrate this new arrival! Additionally, you will also get a FREE RCA premium video for every GM Simon Williams product that you purchase. So, this is just another BONUS for you! 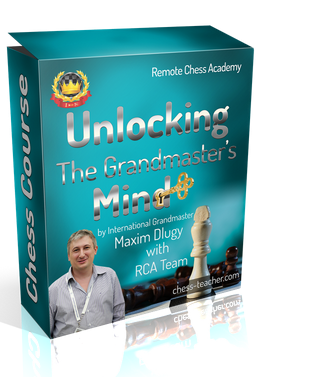 If you purchase the Premium Video “Play like Tal”, you’ll get the RCA premium video “Playing for a win” by GM Maxim Dlugy for FREE. Also, if you purchase the Premium Video “Killer Dragon”, you’ll get the RCA premium video “Chess Opening Disasters” by IM Alex Kundin for FREE. That’s not all, I’ve another cool thing to tell you – if you purchase both Premium videos (Play like Tal and Killer Dragon) during the offer period (i.e. from today until June 24th), you’ll get an additional 25% discount on any RCA course (LINK) of your choice OR any Premium video (LINK), by me of your choice! We’ll contact you (at the e-mail address used for your purchase) to provide you with these special additional offer. I hope that you really like all these bonuses. So, don’t miss this great opportunity! Finally, I’d like to mention a little technical note about these courses: since the courses are very large in size (about 1 GB), we have split the files to make it easy and convenient for you to download and study them. P.S. 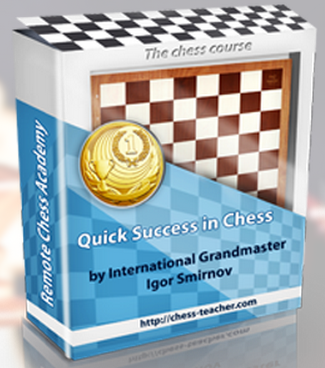 Don’t miss this great chance of getting these high-quality chess lessons with a massive discount and bonuses. Good luck, talk to you soon! Recently, we added a new premium video to our RCA shop – it’s called “Middlegame Pawn Structures” by GM Ivan Sokolov (find out more details about it here: LINK). I’m glad that many of you liked it very much and have enjoyed studying it. As I already said, we’re giving you only the BEST chess lessons and not any random videos. Additionally, I’ve something interesting to share with you today. We’ll be adding more new premium videos to our RCA shop in the near future. As of now, I can inform you that we’ll be adding the premium video “Play like Tal” by GM Simon Williams and another one which will be about a famous chess opening! We’ll add them to our shop very soon. Moreover, today I’ll be sharing with you the introductory video to the DVD “Play like Tal”! In this video, you’ll watch a game from the World Chess Championship – 1960, between the two great chess players, Mikhail Tal and Mikhail Botvinnik. It is a very famous chess game where Tal, the Magician from Riga, who is well known for his sacrifices, gave up material in search of the initiative. “There are two types of sacrifices: correct ones and mine”. Maybe that’s excluded from this particular game (and many other games as well).